Facebook is losing its younger audience to other social media platforms like Snapchat at a higher rate than previously expected, reveals a study conducted by US-based market research firm eMarketer. 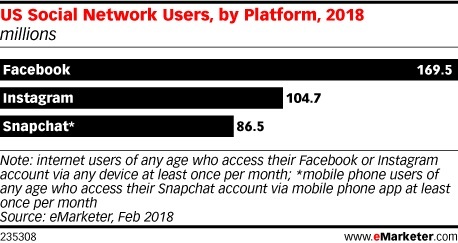 A report based on the study reveals that even though Facebook was banking on Instagram to retain younger users within its ecosystem, a large majority of them are migrating to rival app Snapchat. The report highlights that this year, for the first time, less than half of US-based internet users between 12 and 17 years of age will use Facebook at least once per month. It further reveals that the number of Facebook users, aged 11 and younger, will decline by 9.3% and the number of users aged 12-17 and 18-24 will decrease by 5.6% and 5.8%, respectively. Overall, Facebook will lose 2 million users aged 24 and younger this year and eMarketer predicts that Facebook-owned Instagram will gain 1.6 million users in the same age group. However, Snapchat is expected to achieve more success and will add 1.9 million users in the same age group. Even though Snapchat is predicted to gain more users, Instagram will still be bigger in the US. By the end of 2018, the study predicts that the number of Instagram users will reach 104.7 million, up 13.1% year-over-year, while Snapchat will experience a 9.3% growth and reach 86.5 million users in the same time period.